In the light of the recent death of Jawaher Abu Rahma through tear gas inhalation (see https://corporateoccupation.wordpress.com/2011/01/03/1080/ ) Ryan Olander takes a look at the history of systematic ‘non-lethal weapon’ usage by Israel against Palestinians. It is illegal under international law to use propelled tear gas in this way. 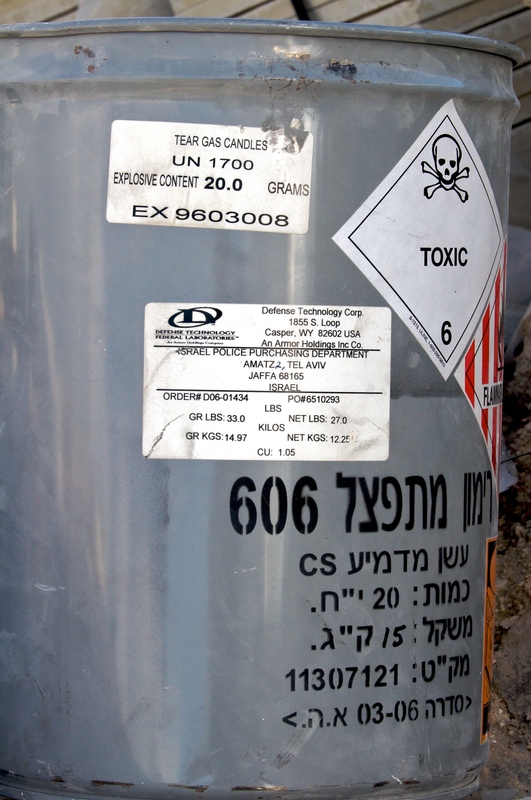 An addendum of the Chemical Weapons Convention (of which Israel is a signatory ) states: “And, as toxic chemicals, RCA [riot control agents] are subject to the requirement that their types and quantities must be consistent with their purpose. This implies that the munitions or devices used to deliver RCA must also be consistent with that purpose.”  The reason it is considered a “less-than-lethal” weapon is because its dispersal effects come as the CS gas they burn are inhaled. This causes nausea, loss of breath and impaired vision. 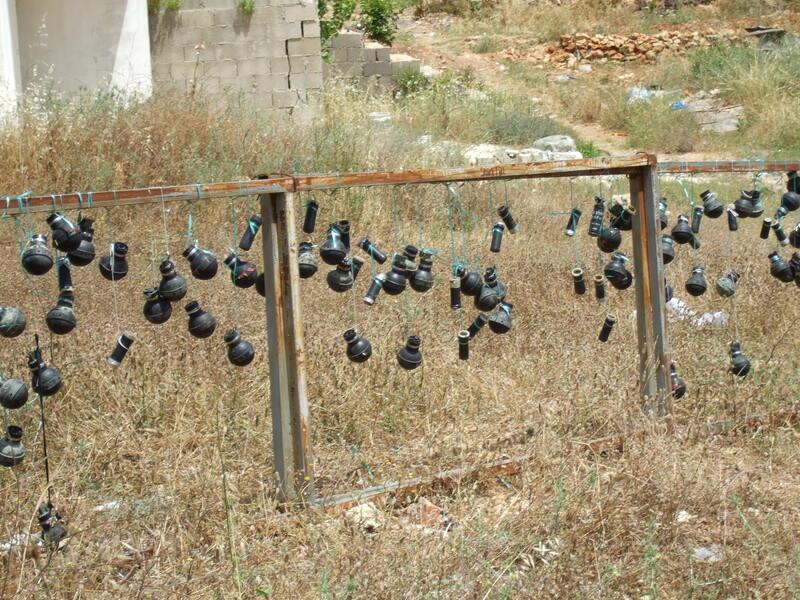 Many times the Israeli Occupation Forces (IOF) use this weapon as projectile to strike nonviolent activists. Instead of firing these heavy metal canisters indirectly and in a gentle arc, the IOF fires them directly at Palestinians, Israelis and internationals. In the beginning of the First Intifada, the manufacturer of Israeli Tear Gas was TransTechnologies. They had massive orders for tens of thousands of rounds. In this period of fertile and mostly nonviolent resistance, the IOF disregarded international law and used tear gas as a projectile weapon as opposed to a less-than-lethal crowd dispersal munitions. While the resistance was being made, the Israeli Military shot tear gas rounds into homes and directly at demonstrators. They paid no attention to the legal way to deploy this weapon, resulting in deaths and gratuitous injuries. A month later Bassem “el Pheel” Rahma, popular committee member of Bil’in, was shot with the same high-velocity round from a distance of 20 meters. He approached the Apartheid Fence to demand that the soldiers stop firing tear gas directly at the nonviolent demonstrators. However, they turned the weapon on him. The canister opened up a 7cm hole in Bassem’s chest upon impact. He died nearly immediately. These are only some of the most horrific consequences of Israeli’s disregard for humanitarian law concerning its riot control agents. But these acts are common place and happen each day throughout the OPT. The homes of An Nabi Salih take on a different appearance each Friday as the villagers prepare to demonstrate against the annexation of their spring by the illegal Halamish settlement. Rugs are draped over windows and doors as the IOF has a habit of halting the demonstration before it begins and shooting tear gas through the streets of the village. In the beginning, before the villagers took necessary precautions, canisters would break windows and suffocate those too young to demonstrate and those past the age of demonstrating who tried to escape the bedlam wreaked by the IOF. It had held 400 tear gas rounds used on the villagers of An Nabi Salih that day. The rounds were produced in the USA, shipped to Israel and misused in OPT each day by the IOF resulting in maiming and death. It’s hard to imagine that CSI is not aware of the results of its tear gas being illegal used in the OPT. However, given the globalized society in which we live, it’s also hard to imagine that CSI will halt sales to Israeli given the massive profits it receives from Israeli’s massive consumption of CSI’s product; hard to imagine without the proper expression disdain and disgust from civil society. Robert Pear. “Israel Accedes to U.S. Rights Monitoring.” June 6th, 1988. New York Times. Hi, very interesting blog you have here! I’d like to invite you to visit my blog at http://www.lesslethalalternatives.com to expand on the discussion of less lethal defense options. Hope to see you there!